Dr. Shaun Dolk, NOAA Global Drifter Program, Miami, FL 33149, USA. As an action group of the Data Buoy Cooperation Panel (DBCP), the IBPIO strives to provide data for real-time operational requirements and research purposes, including support to the World Weather Watch Programme (WWW), the Global Climate Observing System (GCOS), the World Climate Research Programme (WCRP) and the Global Ocean Observing System (GOOS), to tropical cyclone forecasting and monitoring, as well as research activities of participating institutions throughout the region. The programme is built upon cooperation from these partner institutions to not only focus on Indian Ocean interests, but also liaise directly with data users to ensure the programme is meeting user requirements. IBPIO aligns within IIOE-2 Objective 4.2.6. 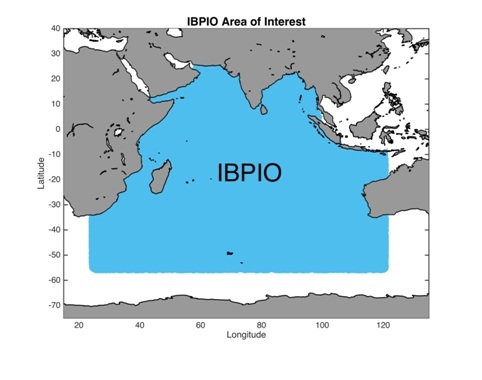 With contributions from partner institutions throughout the Indian Ocean, IBPIO�s region of interest encompasses the entire basin, from roughly 25E to 120E and 60S to 30N.